When I had heard that Wanako Games was involved in the development of a new Ghostbusters downloadable game, I couldn’t help but get excited. Not only are twin stick shooters one of my favorite genres, but the Assault Heroes series are some of my most beloved games in that genre. 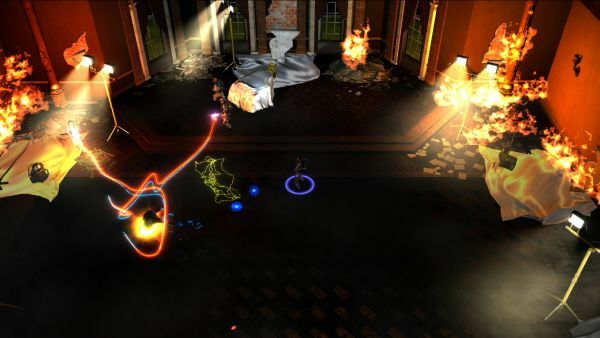 Ghostbusters: Sanctum of Slime continues the tradition of twin stick shooters by the developer, though somewhere along the way development was picked up by Behavior Studios. With co-op development in play combined with an adored 80’s franchise, the game has to be good...right? Ghostbusters: Sanctum of Slime takes place in NYC putting players in the role of four ghost bustin rookies. You see, the original Ghostbusters are overworked and need a vacation - so its time to bring in the backup. The game’s story is played out through comic book style cut scenes loaded with bubbles of writing - and I do mean loaded. In fact, it takes a good 5-10 minutes just to get through the first cutscene in the game - I thought for a minute this was Metal Gear Solid. My impatience finally caused me to skip to get to the game - I want to play after all. Turns out, I’m not the only one who thought these scenes were way too long - as there’s an achievement for NOT skipping any cut scenes. Seriously, if you need to put that in your game because testers were bored, perhaps you should edit things up a bit. Luckily in co-op the cut scenes aren’t played. The game itself plays out like a traditional twin stick shooter, left stick moves while right stick aims your proton pack at the ghosts. 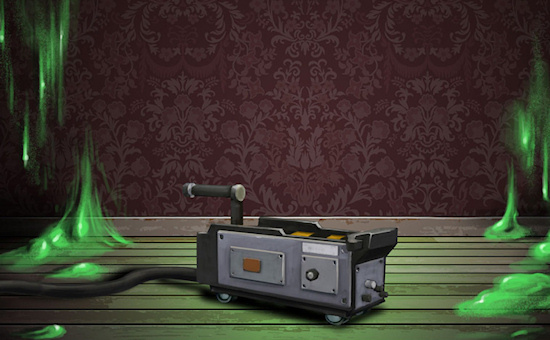 The quicker you kill ghosts in succession, the higher a multiplier goes earning you more cash. Sadly there’s no upgrades or anything to buy with cash, just leaderboard bragging rights. Instead of upgrades you’ll earn two additional weapons by the third mission. There’s a gun that shoots out wide yellow web like things, and a gun that shoots out blue plasma balls that bounce. What are they good for? Well for shooting the yellow and blue enemies! You see, every enemy in the game has a specific color and you’ll need to switch to the appropriate weapon to bring them down as fast as possible. That my friends, is strategy. While this mechanic should make co-op satisfying by having players designate their roles with weapons, the chaotic nature of the game makes it anything but. Combine that with some absurd (and cheap) difficulty later on in the game and you’ll be cursing your co-op partners for not switching to the yellow gun fast enough. Other than this, you’ll find a few pickups like invincibility, health, and bonus cash. There’s also random Slimers that when taken down, give you an additional pickup for the level. Finally you can find Stay Puft Marshmellow men collectibles in random locations for an achievment.